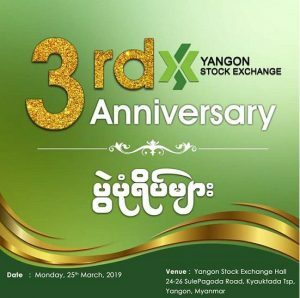 “3rd Anniversary of Yangon Stock Exchange” was held at YSX hall on 25th March 2019. 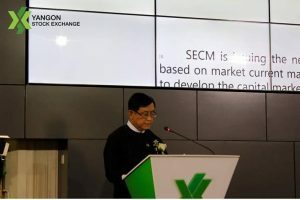 At the Seminar, members of the Securities and Exchange Commission of Myanmar led by Chairman of SECM and Planning and Finance Deputy Minister U Maung Maung Win, Japanese Embassador to Myanmar, Managing Director and Officials of Yangon Stock Exchange. 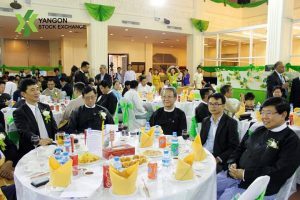 Senior Managing Director of DIR, Senior Executive Officer of JPX, Vice Chairman of UMFCCI, Deputy Director General of DICA, Senior Officials from listed Companies and Securities Companies and invited guests attended. 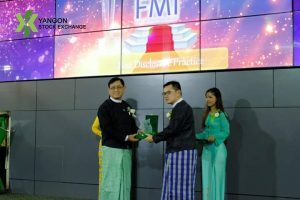 In this event, U Maung Maung Win, Chairman of the Securities and Exchange Commission of Myanmar and Deputy Minister of Planning and Finance delivered the Keynote Speech. Afterwards, Members of the SECM and Managing Director of YSX grants the Best Disclosure Practice award to FMI, Best Return on Equity award to MTSH, Best Share Price award to MCB, Best Dividend award to FPB, First Listed Company with IPO award to TMH, Most Underwriting and Share Trading award to MSEC, Most Securities Account award to KBZSC, Most Proprietary Trading award to CBSC, Certificate of Recognition to AYA Trust SC, KTZRH and UABSC.